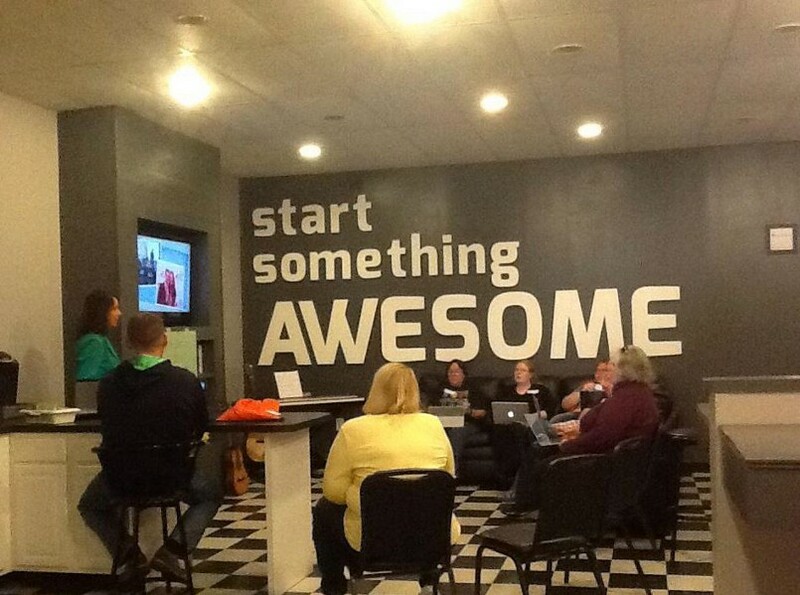 Educators at ScratchEd Meetups play, learn and share together in hands-on breakout sessions. District Technology Resource Teacher Leanna Prater is a force to be reckoned with — especially when it comes to technology in the classroom. A former elementary school teacher, Prater provides instructional technology support to Fayette County, Ky., public schools and offers professional development to their teachers. In addition to her daily responsibilities, which include STEM and LEGO robotics support, Prater also founded and leads the area’s Scratch Educator Meetups. Wanting to maintain that enthusiasm and momentum, Prater followed the Scratch Educator Meetups hosted in Cambridge, Mass., through the ScratchEd discussion forum. Then, in August 2014, she received a grant from The Fund for Transforming Education in Kentucky. One of the goals of the grant focused on the notion of helping teachers using innovative tools — like Scratch — develop a personal learning network. With funding from the grant, Prater and three elementary STEM teachers traveled to New York to meet with other Scratch educators at a CSNYC Meetup. At the New York Meetup, Prater shared her struggle to find ways to sustain initiatives that supported teachers using Scratch in their classrooms. At one point in the discussion, Prater had a transformative realization. She concluded that hosting a local Meetup was the perfect way to allow other teachers have the same experience that she’d had at the Scratch Conference and felt again, at the Meetup — that is, to make connections with educators and researchers, and to see what people in other schools were doing. Returning from New York City, Prater was on a mission to bring this experience to teachers in the Lexington area. With support and guidance from existing ScratchEd Meetups and members, Prater hosted her first ScratchEd Meetup in April. Scratch Foundation recently spoke with Leanna Prater to learn more about the motivation behind starting her own Scratch Meetup, and why she believes peer support systems are vital to instructional technology. How did you become interested in Scratch? As a technology resource teacher, I’m always on the lookout for free tools students can use in the classroom to create products or demonstrate understanding using technology. I came across Scratch several years ago and found myself amazed at how quickly students figured out the program as well as the level of engagement and deep thinking required. Students could test out ideas and work through problems, maintaining a level of persistence you don’t always find from traditional paper/pencil tasks. In Scratch, students can create programs that are very complex or very simple, find immediate help in the program and even connect to the physical world through tools like MaKey MaKey’s, LEGO WeDo and PiCoBoards. By using tools like Scratch, students are developing computational thinking skills needed for this century. Why did you decide to begin your own ScratchEd Meetup? Through my experience supporting other technology initiatives, I have found that teachers need a support system to keep them going. It is especially hard if you are trying out something innovative in your classroom or school and you have no one to brainstorm with, whether that is Scratch, robotics, flipped classroom or some other idea. We do not always have great structures in place to help teachers easily connect with others who have similar instructional goals and interests. I wanted the work that we have been doing with Scratch to continue and knew that helping teachers become connected educators, helping them build personal learning networks, would help sustain the work. Rescheduled twice due to snow and winter weather, Prater’s ScratchEd Meetup finally meets in April at the Awesome, Inc. office. What resources did you use to plan your Meetup? How did everything come together? Based on our NYC Meetup experience, I knew we were going to need a space to accommodate a larger group, small breakout sessions and lunch. I reached out to some of our community partners and sent questions I had to the ScratchEd team to begin planning. We secured a location with Nick Such at Awesome, Inc. here in Lexington, picked a date, and were in the process of trying to find a sponsor for lunch when the Scratch Educator Meetup Guide was released. The Meetup Guide was exactly the tool I needed; it listed supplies, tips for advertising, sample letters and activities to help our Meetup run smoothly. If I had a question, the guide provided the answer. While the event was free, we encouraged people to register to attend on our Eventbrite page to help plan for materials and lunch. To get the word out, we created a Twitter hashtag #ScratchKY and tweeted information about our Meetup during #edchats, advertised on Facebook, and shared details with email listservs and through different community partners. I also sent several personal emails to people who used Scratch around the state of Kentucky. I kept the resources provided from the New York City Scratch Meetup and explored the Cambridge ScratchEd Meetup Google+ page, using both as models for developing, remixing, and organizing collaborative tools for our Meetup. On the day of the event, Nick from Awesome, Inc. had the rooms arranged, the Kentucky Society for Technology Education ordered lunch and we just followed suggestions from the Scratch Educator Meetup Guide for introductory activities, breakout sessions and wrapping up. What was the response from those who attended the Meetup? The Meetup attendees really enjoyed having conversations with others about ways they are using Scratch in the classroom as well as other resources for coding. Several attendees had traveled a couple of hours to come, so I’m glad they found the experience valuable. In addition, many people expressed how they loved the variety of participants. Teachers often lack opportunities to have conversations with educators and community partners outside of school. As people were leaving, many wanted to know when and where we were going to “meetup” again. What did your learn from planning your own Meetup? First, there are people who are willing to help if you just ask. I reached out to many organizations, university professors and teachers to help organize the Meetup. They all were willing to support the initiative through donation of space, food, supplies, advertisement and presence. Not one group or person turned me down. If they couldn’t help in one area, they offered to support the Meetup in another. Second, things happen that are beyond your control and that’s ok, but don’t give up. We planned our first Meetup for February, had advertised for weeks and had many people planning to attend. Two days before our inaugural KY Scratch Meetup, we had a record snowfall in Lexington. I worked with our community partners, rescheduled the date and time for a date in March, only to be snowed out again. Third time around, we chose a date in late April hoping the weather would cooperate. Through planning the Meetup, I also learned that we have many talented teachers in our area that are doing great things and using Scratch in the classroom! I’m so glad the Meetup gave them the opportunity to share the great work they are doing with others! Why do you think it’s important to incorporate Scratch or coding into schools? Almost every job imaginable in today’s world uses something created with code. Since we live in a world that is so connected, our students need to understand the basics of coding, not just to be college/career ready but also to be life-ready. Coding teaches other important skills and develops dispositions in children that are important for other instructional areas, too. Being able to break a large problem into smaller parts, sticking with a problem until you have figured it out, cause and effect, sequencing and working in a group are just a few of the abilities students develop using Scratch. Scratch, too, is a great creative outlet for students. Kids love to draw their own backgrounds and sprites, add their voice or take a photo and change it into something else. Opportunities for creative expression are sometimes limited in school, but necessary if we want kids to become creative problem solvers. Through making and creating, students develop deeper understandings of how things work. Tools like Scratch can also level the playing field for students. Students come to school with a variety of different experiences. Using Scratch in the classroom can provide students a common experience to build and connect new knowledge. What resources would you recommend to teachers who are interested in using Scratch in their classroom? One of my favorite resources for teachers just getting started is the Creative Computing Guide. It is so easy to follow and has activities to help teachers at any experience level bring Scratch to their classroom. I also recommend the ScratchEd site, especially for those looking for lesson ideas, activities or if they have a question. One suggestion I have made to teachers I work with is to explore, play and peek inside games shared on the Scratch community. In a breakout session, elementary teachers discuss the importance of introducing coding to students at an early age. What is your favorite breakout session topic? At our Meetup, I spent most of my time with the elementary teachers discussing integration idea, probably due to my elementary teacher experience. I love how these teachers understand the importance of introducing coding to students at an early age, developing computational thinking skills, and also how those skills connect to other disciplines. To listen to teachers share the fabulous things they are doing with kids and Scratch is invigorating and helps me better understand the vision and goals of teachers that I work with on a regular basis, including what I can do to help with successful integration of creative computing tools in the classroom. What’s next for your ScratchEd Meetup group? We are in the process of planning for next year! We are hoping to have a few Meetups in Lexington — central Kentucky — as well as in the eastern part and northern part of the state. A small group just came back from Scratch Day in Cambridge, too! We have a goal to put Kentucky on the Scratch Day map for 2016! ScratchEd Meetups are coming to New Orleans, New York City, San Francisco, and Chicago! Did you miss our first ScratchEd chat? Here's a recap of our conversation, via Storify. 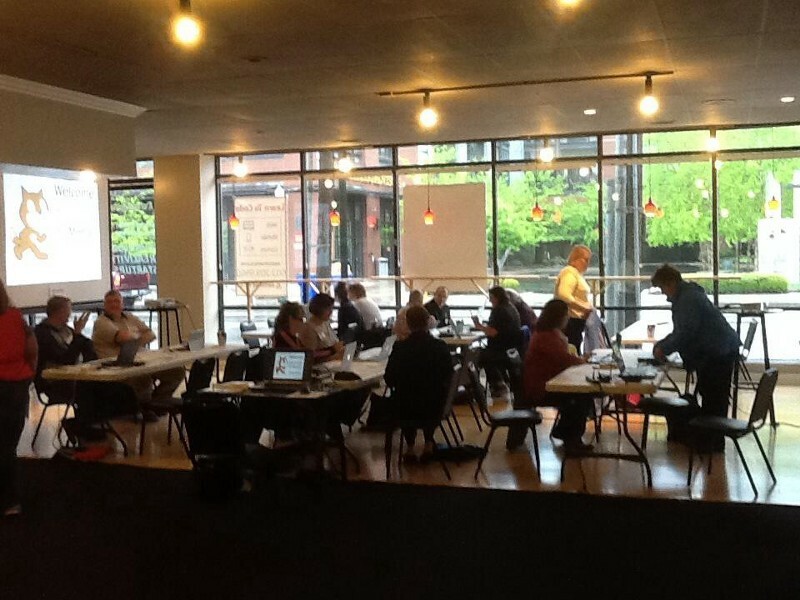 A look inside what happens at a local Scratch educator meetup organized by educators in Cambridge, MA.